Thank you Andy, absolutely love our new garden. Really impressed with your work from start to finish, reliable and professional. Great job from Problock. We have just had part of our garden block paved and we are very please with the work done. We would recommend Problock to anyone, I have already passed their details on to a couple of my work colleagues. We intend to have Andy and his team back to do some more work for us in the near future. Spot on, Thanks Andy a very professional and reliable company. Brilliant and high quality professional work. Very polite, efficient and professional throughout. Started on time and completed the job to a very high standard. I could not be more please with Andy and his team. I would strongly recommend them to others and will have them back to do other jobs in the future. Thanks. Andy and his team have just finished an extensive patio and pathways for me and I couldn't be happier with the results. Exceptional from start to finish, from initial contact, quote and installation. Courteous, hard working and very professional. Highly recommend. I have more to do later and will not hesitate to bring Andy back in. Andy and his lads have just laid a lakeland stone patio, quality job, called round before starting to just run through the work, turned up when he said he would, finished on time and all tidied up after themselves. Would recommend. What a Fantastic job they done! Had a miserable looking Drive, but Andy & his team Block paved it & rendered the wall that runs down the length of the drive & what a difference it has made. All the neighbours are impressed!!! Trouble is I don't want to put anything on it now! They cleaned up after & left it all spotless! Would definitely recommend. Andy and his team have carried out 3 block paving projects over the course of the last ten years and we have been impressed by his high standards and attention to detail. He transformed our small back garden into a beautiful space we can enjoy and the quality of his work has stood the test of time. We have recommended him to friends who have also been very happy. He is an honest and reliable professional who takes pride in his work. Just had a second driveway done by Andy and his sons, this time for my brother (who is disabled). He's done another amazing job, turning a patch of grass into a beautiful block paved driveway. He was on time, courteous, understanding of my brothers needs and me and my family can't recommend him enough. "Such a satisfying job". Installed new driveway and disabled ramp for one of my customers who for the first time in 18 month was able to leave his house unaided. Love our new garden it's fabulous, so pleased we decided on PRO BLOCK.. Andy and Luke have done a fantastic job both very professional and gave us lots of ideas too, they even moved a couple of drains nothing was too much trouble. Many many thanks to Andy and Luke for a good job well done. Excellent professional work done to a very high standard, nothing was too much trouble and I felt totally at ease whilst they were working. The site was always left safe, clean and tidy and they always arrived on time weather permitting. Anything I was unsure of, Andy had useful input and I would not hesitate to recommend them to anyone. Its been very reassuring to find tradesmen who take pride in their work. We chose Andy at Pro-block initially to lay some outside paths around the front of our house and also a patio and landscape to our back garden. He offered advice and help to design it, was tidy, very organised and always turned up when he said he would. He was very pleasant, as was the other guys who worked with him. We were so impressed with the quality of his work we asked him to do our drive a couple of months later. Again the work was the same standard. I would recommend him without question, you get what you pay for - quality is not always the cheapest. I chose ProBlock above several local competitors and never regretted the decision. From day 1 of the project Andy and Luke provided excellent customer service combined with first class knowledge and counsel. This was exemplified by their attention to detail and it is apparent that they take tremendous pride in their work. The materials used were of the highest standard and I am very impressed with the finish. I can say unequivocally that ProBlock are the best out there. Also thanks for installing the outdoor tap!! Thanks andy for providing me with a most gorgeous patio n landscaped garden in October 2012, despite the horrendous weather, still waiting for the sunshine t njoy it but im now proud n happy to open my patio doors n look out at it all. youre time keeping was excellent, so clean n tidy I was left with nothing t clean up, n u were always professional n polite even when I kept changing my mind, n now im waitin for a quote for my drive n front garden. I will only employ someone with a good reputation or has done agood job for me before, thanks again. A good job well done. Turned up on time, worked hard and an excellant result. Would definately use this tradesman again and would recomend him to anyone. 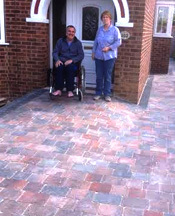 Andy constructed a new patio and relaid our driveway. He was happy to give good creative input which is what we were looking for. He worked tidily and cheerfully, giving us a high quality result and we wish we could afford to have him landscape the rest of our garden. We don't think the name Pro Block reflects the broad range of services Andy offers! We'd certainly hire him again. Andy and his son have just completed an L-shaped block paved car parking area for me. What appeared to be a fairly straightforward job turned into a nightmare mainly due to the rain we have had recently which flooded the area. However, Andy took it all in his stride, dealing with all the difficulties he encountered, large and small and which included extra work not originally planned for, with equanimity. Andy proved to be polite, reliable, punctual and has an easy-going disposition which was required as I am a bit of a worrier!! He made useful suggestions but also made certain that the finished product was what I wanted. At the end of each day the site was left safe and tidy. Andy and his son did an excellent job. The end result can't be compared with what had to be dealt with. It looks great! I wouldn't hesitate to use his services again or to recommend him. Andy Bulman, from Pro-Block did a great job for me , job involved block paving and building brick pillars, Andy was most helpful very neat and tidy , arrived when he said he would ,came up with good suggestions, nothing was too much trouble for Andy ,i would have no hesitation in recommending Pro-Block to anybody who is looking for a First class job. Andy was at our house two weeks or more and in that time he did the footings for a large extension that we were having built, he also moved various drains and pipes and laid a patio which he also pointed up. He took a lot of pride in his work and everything was done to a very high standard. I found him to be a very easy going and nice natured guy who offered lots of good advice throughout.He was very polite, reliable and always punctual and I would have no hesitation in recommending him. We had a complete new landscaped gardening/patio/path area carried out by Andy and his son. The existing lawn area was raised and re-turfed along with a new large patio. Quality of workmanship was excellent, the work was carried out on time, weather allowing. Budget increased as more work was carried out than originally intended. The project has totally altered the appearance of the garden and pathways. Andy is very down to earth, likeable and was willing to bring samples to the property beforehand. His ideas were adopted and welcomed. I recommend him totally. Andy has been professional since his 1st inspection visit, he took on board our requirements for our new driveway and made suggestions regarding the layout and design that made sense. He arrived on site each day promptly and the job progressed very smoothly. The job site was always neat and tidy at the end of each day and consideration was shown to how the works may affect our neighbours. Andy is a very easy going yet professional tradesman and I have no hesitation in recommending him to anyone. He specialises in block paving and it shows in the quality of his work.